We live in Seattle, where space is tight. Our house isn’t tiny (I know of families of five squeezing in comfortably and with lots of chic style into 600 square foot New York apartments), but I do feel like we’re busting at the seams sometimes. (Seriously, if I step on a Lego, dinosaur or truck one more time…!) I’ve often thought about built-in bunk beds for my three boys (on days when I’m not feeling uber paranoid about them falling from the top bunk and breaking their arms! ), and if we did it, we’d do something just like this! 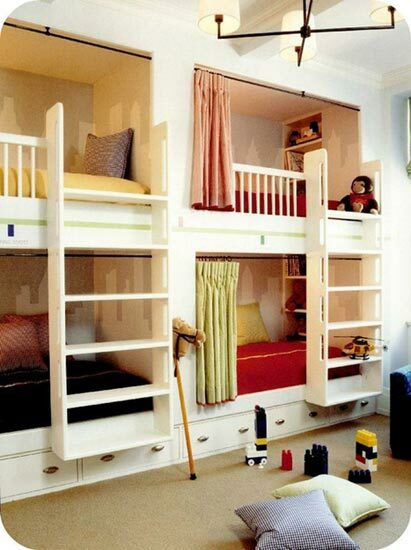 Don’t you love these bunks (photo found on Pinterest, here)? I think those are just adorable, each bed looks cozy and inviting, and a little hide-a-way. Imagine the fun your boys would have!! My girls shared a bedroom from birth until leaving for college, while they fussed about each others’ messes, I think it did them well to learn to share. These would be so much fun for a child! Awesome!! I LOVE these bunks ! I wish I had seen something like this when my 5 boys were growing up. We had a bunk with a trundle and another single bed. Our last son, who happens to be handicapped, slept in our room for a number of years. Since we only have two bedrooms, this would have been ideal. As long as there are good strong rails and you practice climbing up and down, there should be no problem with falls. I wouldn’t do it until they’re 4 or 5.